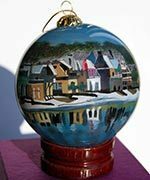 The masterful photography of Geri Dibiase is combined with the ancient art form of "Eglomise" to produce these very beautiful and unique glass ornaments. Eglomise is a Chinese art form that began in the early 1800's. 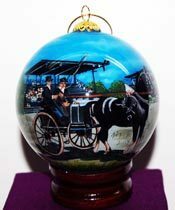 Painters using small, curved brushes insert the brushes into the small hole at the top of the blown glass ornament to recreate images on the inside of the glass. Each piece is handcrafted to create a keepsake that can be treasured for generations. Custom designs also are available and are perfect for fundraising for churches, schools, museums, and other organizations. See below, or Contact Geri, for more information. 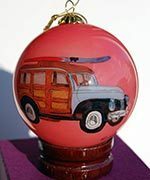 Geri creates and produces custom-designed glass art pieces. Choose from many currently available designs, or have a special design done just for you. 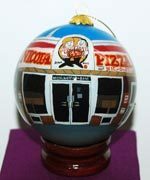 Custom designs are perfect fundraising items for churches, schools, museums, businesses, and other organizations. All glass is packaged in padded, purple satin boxes. For custom designs, your choice of writing is limited to 2 or 3 lines of type. Please contact Geri for pricing information. Time needed for custom designs: 8 to 10 weeks for sample delivery after submission of photograph or artwork. 12 to 14 weeks delivery once your order is placed (example: for September delivery, photgraphy must be taken by March, order placed no later than May). Terms: First order is COD. Future orders are Net 30 days, pending credit approval. All orders must be placed in increments of 72 pieces. Shipping charges apply.